It is Linda’s mission to become her clients’ Real Estate Advisor, not only for property in Tahoe/Truckee, but also to help manage their entire real estate portfolio. “So many of my clients need support outside of my geographic area. I have aligned myself with the most professional real estate networks in an effort to serve all of my clients’ real estate needs, wherever they may be”. You get so much more than an ‘Agent’ when you choose Linda – she will be your consultant for life. A native of Orange County, Linda moved to the Lake Tahoe Basin in 1985 and ran a property management and vacation rental company. 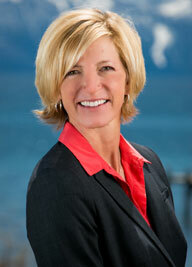 She transitioned to sales in 2001 and quickly rose to the top of the Tahoe realtor rankings. In life as in real estate, Linda always sets her sights high. She holds a Black Belt in Shorei Ryu Karate, is a United States Diving Champion, and couldn’t be prouder of raising four wonderful children in the Tahoe community she loves.